I was trying to make potato chips at home but forgot wash off the excess satrch from the freshly cut potato slices.I have already dried them off. Now when i fry them they turn brown giving a burnt off kind of taste.what should i do??? 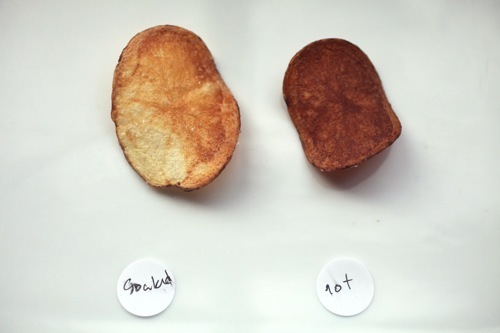 Interestingly, after some experimentation, Kenji discovers a technique of first boiling the raw potato in a vinegar solution, drying, and then frying. According to him this gives the lightest coloration and cleanest taste. I highly suggest checking out that article. In the meantime, I don't see why you couldn't simple re-soak your sliced potatoes now. You could even try out the par-boiling method indicated in the article if you are feeling adventurous. Unless your spuds have gone completely brown sitting on your cutting board you should be good to go.